EASA has granted a type certificate to the Russian-made SSJ100B-100, a version of the Sukhoi Superjet 100 regional jet. This particular modification is powered by increased-thrust Powerjet SaM146-1S18 engines, OEM Sukhoi Civil Aircraft Company (SCAC) reports. The modification enables short-runway operations, including from airports within city limits. 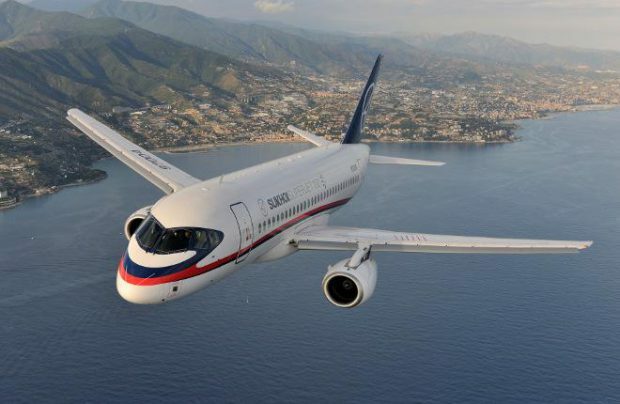 A SCAC representative told Russian Aviation Insider that the more powerful SaM146-1S18 engine produced by PowerJet (a joint venture between France’s Safran and Russia’s NPO Saturn) is used on the Superjet’s SSJ100LR long-range version. The powerplant has a maximum takeoff thrust of 8,055 kgf. If installed on the baseline aircraft, with its 45,880 kg MTOW, the engine would reduce the takeoff distance by 10% from the baseline’s 1,731 m.
Russian certification of the SSJ 100B-100 was achieved in December 2015. The only European SSJ100 customer is Irish carrier CityJet. The airline wet-leases its aircraft to other carriers. There is no information as to whether CityJet is planning to order the increased-thrust version. SCAC expects the new modification to boost interest in the Superjet among airlines that operate in hot-and-high conditions, particularly in the BRICS countries (Brazil, Russia, India, China, and South Africa). Earlier, the manufacturer’s parent company United Aircraft Corporation signed an agreement on creating a joint-capital leasing company in China in order tto deliver up to 100 SSJ100s to that country.